Hi D! Loving your special treasures that you found. I would not have been able to leave them behind either. They just fit beautifully with all of your collections. Have fun with them! What great finds! I've wanted a butter slab like that for ages, lucky you! Yes, you must go back for the planter, it's gorgeous! Love your finds. Get that planter ASAP!! Beautiful finds, Delores! That planter has your name written all over it! Hi Delores, I love the butter slab and the bottles! I also have an obsession with advertising ironstone. I love these and now I am fully jealous of your flea market. I love advertising wares too. I have a big cheese slab and would love to get a butter one also. The bottles are wonderful too. I love them with the other perfume bottles. Delores, I can't believe you found wicker covered bottles!! What a find! 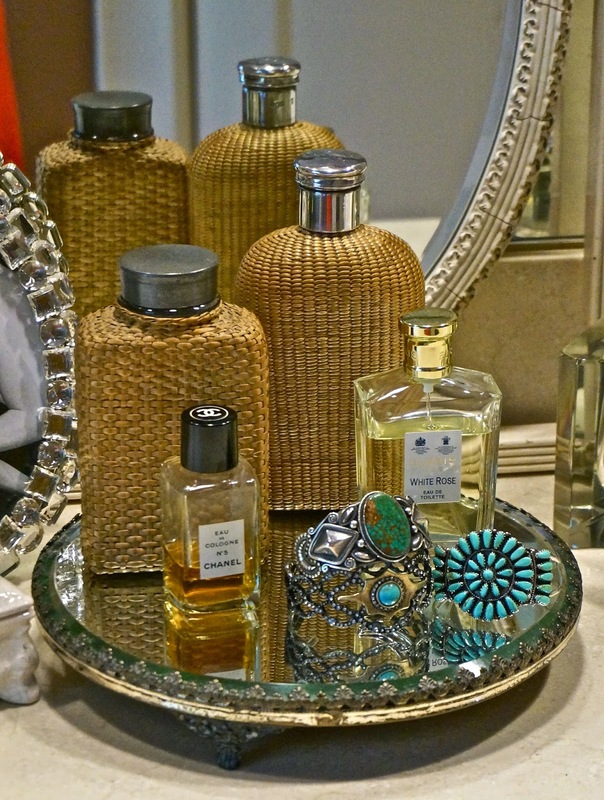 Love the way you styled them on your dressing table. Sonoma Country Pine is a wonderful store, if you ever come to the area! As a store owner, I aspire to be like them. Fortunately, they have the clientele that can afford treasures they find. You have found some beauties, Delores! Love the wicker bottles!! Enjoy them! YES< YOU MUST GO BACK and get the planter!Especially if your friend has its mate!